Vladivostok is one of Russia’s easternmost cities. Until four years ago it felt like a forgotten outpost but, as a result of September 2012 APEC summit, has now become a modern port town - and one of the best places to visit in Russia. The Trans-Siberian Railroad travels over 5,590 miles east from Moscow, ending here on a mountainous stretch of land called the Muravyov-Amursky Peninsula, which juts out into the Sea of Japan. Vladivostok is a vibrant city where the old and the new collide. The city is built on a series of sloping mountains that rise from the sea like a frozen waterfall. Furious traffic moves along roadways carved into the terrace-like topography. Old log cabins stand next to concrete blocks of outdated Soviet apartments . Glittery new casinos light up back alleys with flashes of neon, while tankers and naval ships pull in and out of the harbor. Just four years ago, the city of Vladivostok felt like a forgotten outpost; traffic lights were absent from many intersections and the city’s sidewalks were crumbled. But massive construction projects in anticipation of Vladivostok’s hosting of the September 2012 APEC Summit have resulted in a modern city, with new streets and pedestrian stoplights that make exploring this port town on foot a pleasure. The new Russky Bridge — currently the world’s largest cable-stayed bridge— arcs over the sea and connects Vladivostok with nearby Russky Island, which was the site of last year’s APEC Summit. Fog rolling in from the ocean and old trams that clunk along the streets inspire many travelers to dub Vladivostok “The San Francisco of Russia.” Now the city has an iconic bridge to match. Just an hour ahead of Sydney, Vladivostok is an ideal location for Australians seeking a glimpse of modern Russia. The brand new Terminal A of Vladivostok’s airport now welcomes visitors arriving on regular connections between Beijing, Seoul, and Tokyo. If you are visiting Far East Russia on holiday or business — or you just completed the final leg of the epically-long Trans-Siberian Railroad from Moscow—you will enjoy spending a few days here. Vladivostok’s train station is a natural starting point for a wander around town, especially if you’ve come in on the new commuter train from the airport. Built to resemble the Yaroslavsky Railway Station in Moscow, this ornate building houses striking murals, a small café and a glimpse of the world’s longest railroad. A stairway inside the station leads down to several ticket counters and doors, where curious travelers can take a walk on the train platforms. Across the street from the train station is a post office with a small Internet café, supermarket and an almost playful Lenin statue. Just north of the train station is Svetlanskaya Street. There you’ll see what locals call, “The White House” — a tall building where the regional government works. Walk east on Svetlanskaya for a block and you’ll arrive at Vladivostok’s Central Square on the right — a good place to sit, watch locals, and observe Russia’s Pacific Fleet, which docks right along the waterfront in Golden Horn Bay . Head west along Svetlanskaya up one of the city’s many hills and you’ll see Sportivnaya Harbor below—a wide crescent beach where you can watch the sun slip westward toward China. During the summer, nearby kiosks sell snacks and trinkets. In the winter, locals venture onto the frozen bay to ice fish. From the shore of Sportivnaya, you’re just a quick walk away from Admirala Fokina Street — Vladivostok’s pedestrian street. One local reported that construction crews rebuilt Fokina three times before the APEC Summit! Fokina is peppered with a good selection of restaurants and bars that offer a sampling of the city’s diverse fare. Try the restaurant Izbushka (9 Fokina) for Russian staples, Maruo Giavanni for brick-oven pizza (16 Fokina), Edem for sushi (22 Fokina) and Five O’Clock (6 Fokina) for coffee and sweets. Café Pyongyang , Vladivostok’s North Korean restaurant, is a unique dinner option. Walk or take a cab south of the train station to 68B Verkhneportovaya Street, where you will see the entrance on the right, under the curled edge of a green pagoda roof beside Hotel Corona. Café Pyongyang is an icon of former Soviet ties with North Korea. To this day, a line of the Trans-Siberian Railroad still travels from Moscow to Pyongyang, passing near Vladivostok. This restaurant, staffed by North Koreans, is a remnant of the country’s special history with Russia. Waitresses at the Café Pyonyang sit foreigners and Russians in one room and Koreans in another. The menu is fairly expensive, but the seaweed salad, pork and kimchi — fermented cabbage with spices — and a beer are reasonable. Grab breakfast downtown, and then head to the Arsenyev Regional History Museum (20 Svetlanskaya) to see its displays on Vladivostok’s colonial past, as well as local flora and fauna. The taxidermies of a Siberian tiger and grizzly bear makes the Russian Far East feel like a strange mix of Africa and Alaska. There’s also the Vladivostok Fortress Museum , located on the hill overlooking the north end of Sportivnaya Harbor. It’s an interesting look at Vladivostok’s military history, and you can also take pictures next to gigantic torpedoes in the yard outside. Head back to the main square and walk down Naberezhnaya Street: You’ll see the giant S-56 submarine on the left, a real sub that is now a museum. Within sight of the S-56 is The Triumphal Arc — an intriguing structure that almost resembles an oriental pavilion and sums up Vladivostok’s cultural fusion perfectly. Vladivostok has a great funicular on Pushkinskaya Street that you can ride up to take in afternoon views of the city and surrounding islands. The actor Yul Brynner was also a Vladivostok native. You can visit the house (15 Aleutskaya) where he was born, which is now a museum. For a unique shopping experience, go to the Chinese Market — a sprawling open air market where vendors mainly from China and Central Asia sell everything from sweatshirts and blowtorches to stereos and canned borscht. The bizarre is visually interesting and also contains indoor restaurants serving great Chinese, Korean and Uzbek food. To get here, catch a bus downtown that goes to the “Kitaiski Rynok” (ÐÐ¸ÑÐ°Ð¹ÑÐºÐ¸Ð¹ ÑÑÐ½Ð¾Ðº), or take a cab. The Vladivostok Philharmonic Hall (15 Svetlanskaya) hosts classical music and jazz concerts. 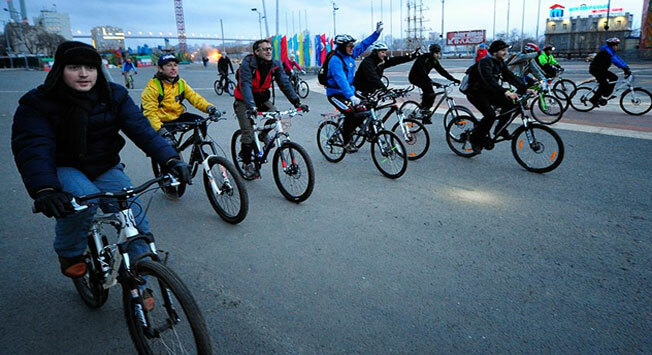 The city’s football team, Luch-Energiya, plays games in the stadium off Sportivnaya Harbor. Brauhaus Han is a German beer house (25A Fokina) with live music — and a good place to start if you’re anticipating a long night ahead in one of Vladivostok’s clubs. Consider a daytrip outside the city. If you want to briefly experience the Trans-Siberian Railroad, take one of the electric trains (three daily) to Nakhodka—a nearby port city—for the afternoon. Within striking distance of town is Russky Island — the site of the APEC 2012 summit. The island is home to Far Eastern Federal University’s new campus, conference halls, hotels and a soon-to-be-opened aquarium. Despite the development, the island still has nice beaches, great views of the city and the Voroshilov Battery (a military fortification worth exploring). You can take a ferry from the city’s terminal (6 Korabelnaya Naberezhnaya Street), or take the quicker route over the new bridge. In the summer, it is worth visiting one of the many sandy beaches (Shamora, 40 minutes north) near Vladivostok. Ferries also depart from the terminal for surrounding islands. Popov or Reyneke islands (12 and 15 miles away, respectively) have few residents, warm water during summer and pristine beaches. There are a number of day tours to ecological reserves, where visitors can see Siberian tigers. Russia Tour (Office 243, 1 Nizhneportovaya, +7 (423) 2 497449) offers a trip to a reserve north of Vladivostok that returns the same day.